Mahalo to everyone for making our first ASIS Futsal Tournament a success!!! Mahalo nui loa to all coaches and participants in our second annual tournament! 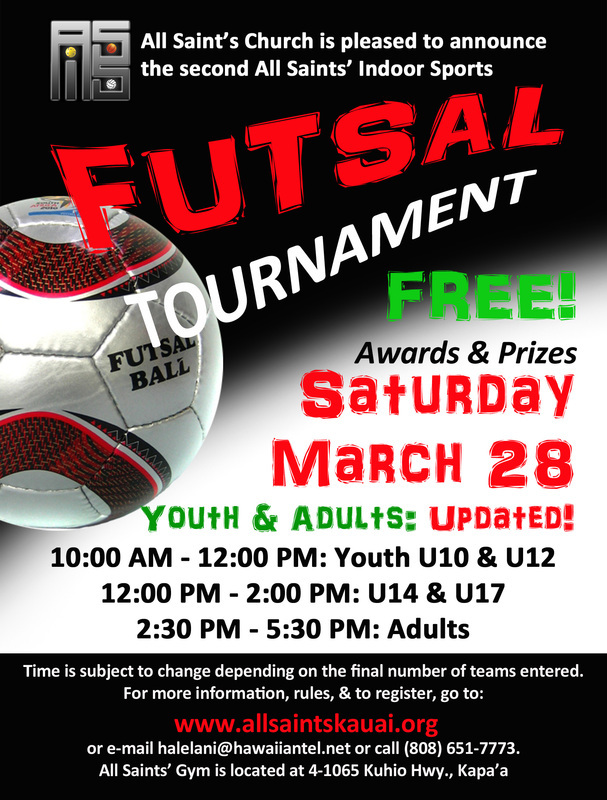 The second ASIS Futsal Tournament took place on Saturday, March 28, 2015, with 5 age divisions and over 30 teams registered. The U10 & U12s were booked up with 8 teams each plus a waitlist! The competition and skill level were amazing! Thanks to all the coaches and parents for supporting the youth in our community, and of course we love our adults who bring a super level of excitement and action to the tournament! Special thanks to our head referees Kevin Cram, Shane Nishioka-Healy & Noah LaMadrid, and to Wally Rezentes for bringing over the goals. We couldn't do it without you! If you have photos from the tournament that you wouldn't mind sharing, please e-mail them to halelani@hawaiiantel.net. We'd love to post them here and on our Facebook page! ASIS Futsal Rules are similar to the U.S. Futsal Rules, with some modification to game timing, court size (to accommodate the limited size of the facility), and referees. Because the ASIS program focuses on fun and fellowship, we ask all participants and spectators to HAVE FUN! Some changes have been made to accommodate all the teams that affect the time and format of the games. Please contact Sybil for details at 808-651-7773, or e-mail her. The first ASIS Futsal Tournament took place on Saturday, June 28, 2014. Mahalo to all the teams that made our first ever ASIS Futsal Tournament a success! Special thanks to Wally Rezentes for bringing the goals, and to Shane Nishioka-Healy for promoting the idea of this tournament. Friendly scrimmages are held in the All Saints' Gym periodically. Check back for updates or like our Facebook page for the latest updates! Questions? E-mail halelani@hawaiiantel.net, or call (808) 651-7773.